It’s that time of year where the winter weather is wearing thin and people are daydreaming of warmer climates. Spring break is right around the corner and Florida is one of the nation’s top spring break destinations. While you’re planning your sunny getaway, be sure to allot a few days for thrill-seeking in some of Florida’s paddling hotspots. 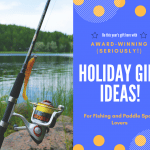 Read on to discover some of Florida’s best paddle trails and other adventures you can enjoy in the great Florida outdoors (don’t forget the fishing rod for one excursion!). Being a peninsula, beach life is, of course, a big draw for people who live in and visit Florida. 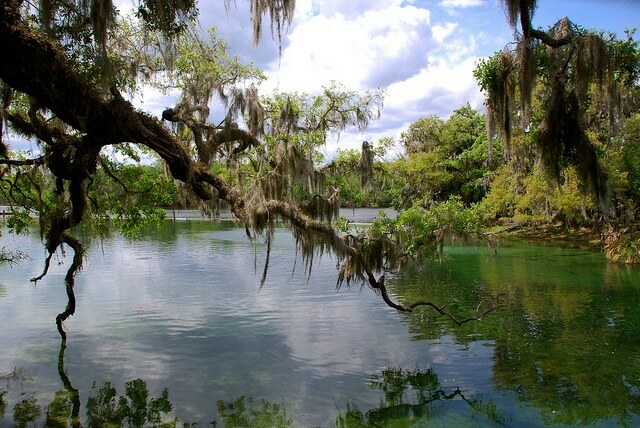 Even so, Florida has many other unique geological features that often get overlooked: spring fed creeks and rivers, underwater caves, inland swamps, and a diverse ecosystem full of birds, fish, gators, panthers and black bears, oh my! 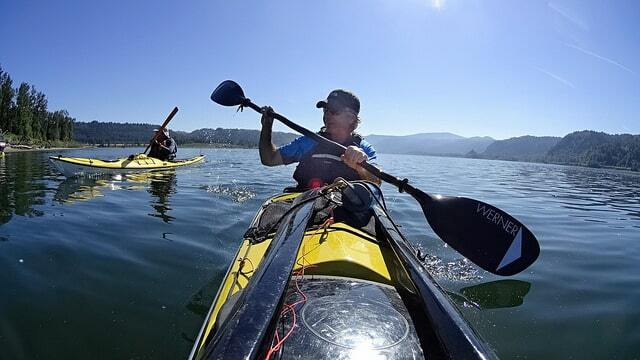 While there’s certainly plenty of fun to be had at the beach (and one of our activities is at the beach), be sure to try out some of these other exciting excursions and adventures while you’re getting your paddle on! Paddle and Play With the Manatee! Just an hour and a half north of Tampa is a spectacular spring-fed river known as the Crystal River. It’s a 7-mile waterway that flows into the Gulf of Mexico. The river is formed by a group of 28 springs that originate in King’s Bay. What makes the Crystal River and King’s Bay such a popular destination is that it’s a popular place to view Florida’s endangered manatees. The manatee travel up the river, particularly in the winter, to escape the colder Gulf waters. They congregate in and around the spring-fed waters of King’s Bay, which are warmer. There are several launch points for kayaks around the bay where you can paddle around and try and get close to some of the manatee. 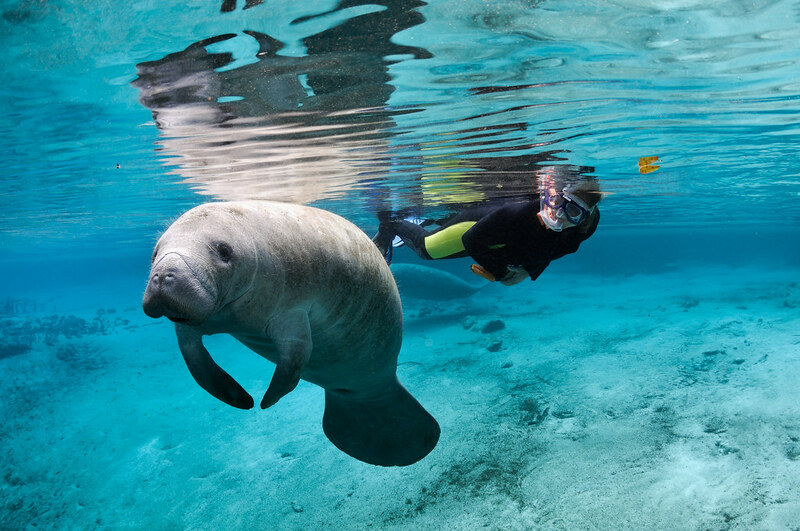 If just paddling with the manatees isn’t enough of an adventure for you, there are also several outfitters that will take you out to where you can swim and play with the manatee! Crystal River is the only place in Florida where there are licensed and approved tours that allow you to get up close and personal with these friendly and curious creatures. Even though approaching the animals yourself is a no-no, their innate curiosity will often see them coming up to you for a closer look. It’s imperative to let them dictate the encounter and not the other way around. The best time of year to experience one of these encounters is in the winter months from November through April, although Crystal River is one area where it’s possible to see manatee year round. Paddle and Dive Florida’s Underwater Caves! Unbeknownst to many, Florida is home to one of the world’s most robust underwater cave systems and is a major destination for those who enjoy technical cave diving. You’ll find one such cave system at the very north end of Florida’s panhandle near Marianna. Marianna is about 2 hours east of Pensacola and 1 hour west of Tallahassee. Here you will find a fabulous spring fed reservoir called Merritt’s Mill Pond. With crystal clear water, this is a great destination for paddling in serenity. You are also able to view all sorts of wildlife both above and below the water. You can launch your paddle board or kayak from the northern end of the waterway near Blue Springs Park. Roughly half of the pond’s springs are concentrated at this point with another half of them located about halfway down the pond. You can take a leisurely paddle in fairly calm waters and enjoy the breathtaking scenery throughout. If you’re an experienced cave diver (emphasis on the word experienced! ), it will definitely be worth it to stick around and explore some of the underwater caves that lie beneath the pond. 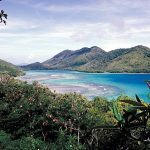 The easiest and most accessible site is the Jackson Blue dive site. While it requires a check-in with the local sheriff’s office and a payment fee, this is one cave system that doesn’t require a boat to access it. Most of the other cave entrances at the pond require a boat to reach the entrance and are much more technical dives. The Jackson Blue site has thousands of feet of cave to explore, but some of the most fascinating aspects of it are within just the first 200 feet. Here is a list of other popular cave diving sites in north-central Florida. Merritt’s Mill Pond — come for the paddling, stay for the diving! Paddle and Surf Florida’s Space Coast! Despite the world’s best surfer, Kelly Slater, hailing from the great shores of Cocoa Beach, the Sunshine State is not exactly renowned for its killer surf scene. Indeed, many surfers actually look forward to the tropical storm systems that touch Florida’s waters because it offers better surfing opportunities for them! That being said, the new sport of SUP surfing allows paddlers to catch waves in even the most mediocre paddling conditions. The reason SUP surfers can thrive in less than epic wave conditions is due to the vertical nature of the sport. 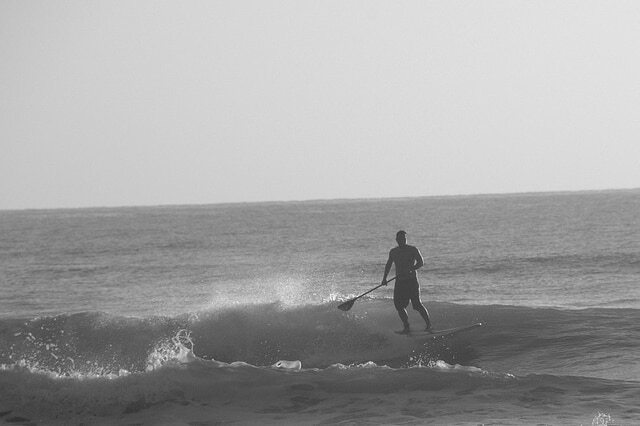 Rather than lying prone on the board like a surfer, the SUP surfer is upright and can see the waves forming in the distance well before a regular surfer. Not only this but SUP surfers can start to gain speed faster than regular surfers which enables them to catch the waves sooner. All of this allows SUP surfers to be able to take advantage of even the mushiest waves that would leave traditional surfers waiting for the next set. This is why the sport of SUP surfing is perfectly suited for the coast of Florida where knee-high waves are, for better or worse, par for course. That being said, if there are going to be waves at all, they usually occur on Florida’s Space Coast. The Space Coast encompasses the roughly 100-mile stretch of shoreline that spans from Melbourne up to Daytona Beach. The popularity of these beaches for SUP surfing is highlighted by the fact that the Eastern SUP Surf Circuit hosts 3 competitions in this area: one in Jensen Beach, one in Melbourne Beach, and another just north of the Space Coast in St. Augustine. SUP surfing is oodles of fun and a great workout. That being said, it’s probably better suited to more experienced surfers or paddle boarders. It is highly recommended that beginners take some lessons before attempting to surf on their own. Pros also recommend practicing at less crowded beaches where beginners will be less of a threat to surfers and other beachgoers. It’s a great sport to take up for those willing to dedicate the time and effort to excel at it, but make sure to read this page for more info on SUP surf etiquette before you get started! 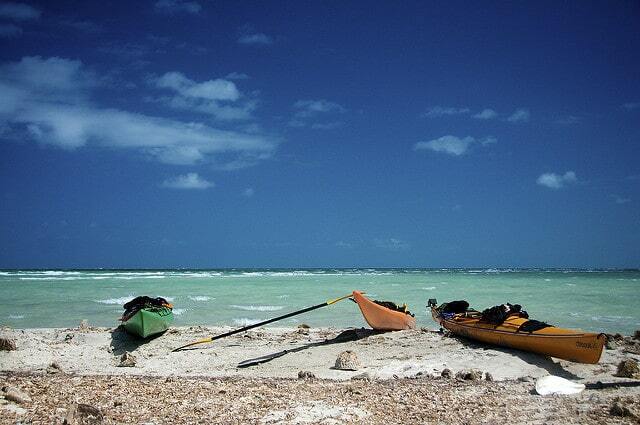 Paddle and Camp the Florida Keys! For those who aren’t native to Florida, the Florida Keys consist of Key West and nothing else — but that couldn’t be further from the truth! While Spring Breakers in Key West are reveling in the debauchery, the rest of the Keys remain a natural wonderland ready for those who choose to revel in her splendid beauty instead! Take a paddle on the wild side and pack out your kayak or canoe for a days- or week-long paddle and camping trip down the Florida Keys. Fortunately, the Florida Office of Greenways and Trails has a handy guide that offers a sample itinerary of how to navigate a paddle through the Keys. The guide includes helpful information like where to launch from, where to camp, distances between destinations, accommodations, places to explore along the way, and phone numbers of important services you might need when you get there. If you’ve got room, pack a fishing rod so you can take part in some of the legendary Keys fishing along the way. Also, make sure to have a decent pair of civvies stowed in case you want to head ashore and dine at one of the myriad cafes and restaurants that dot the towns in the Keys. 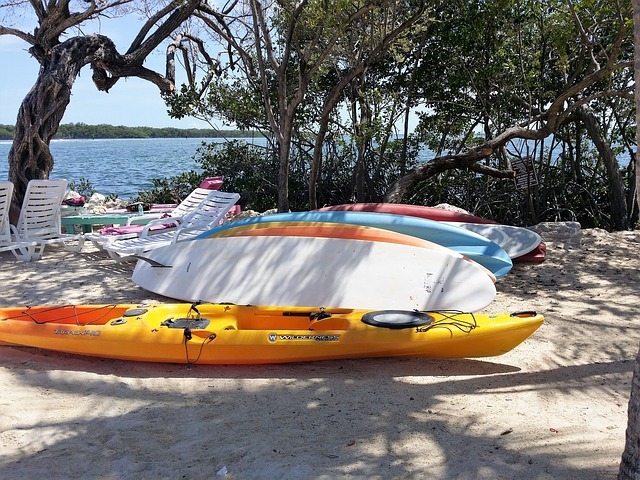 One of the great things about embarking on a Florida Keys paddle and camping trip is that you get to enjoy the scenic beauty of both the Atlantic Ocean and the Gulf of Mexico. Additionally, you also have amenities and eateries at your fingertips in case of emergency or if you just need to escape the elements. It’s the best of both worlds! 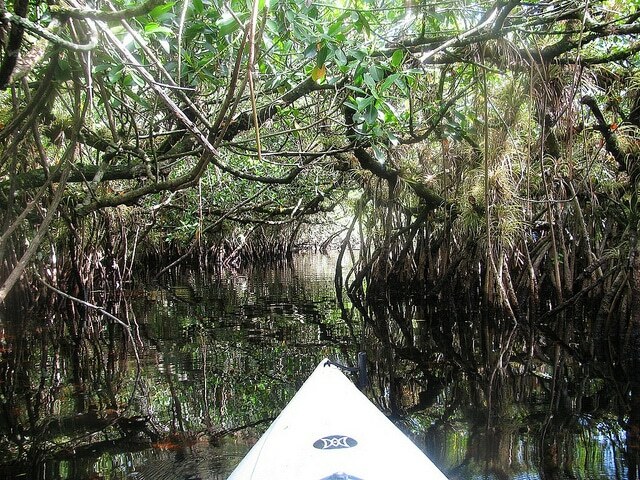 Paddle and Fish the Florida Everglades! What kind of adventure guide would this be if we didn’t mention a trip to the famous Florida Everglades? Wrestle some alligators, snorkel the murky waters, and frolic in the sawgrass while….haha, just kidding! What you can do is contact one of the many tour operators around the Everglades and book a kayak fishing expedition! Fishing the Florida Everglades is pretty epic as it offers the opportunity to catch several species of prized fish including snook, tarpon, pompano, jack, redfish and tons more too numerous to name. Yak anglers can explore the canopied mangrove forests that most motorized boats can’t navigate. In addition to providing serene beauty, these quiet areas provide ample spots to hook up with some fish that are usually only found lurking in the shadows. The Everglades encompass such a huge area — almost the entire southern tip of Florida!— that there are numerous jumping off points for an Everglades kayaking excursion. One of the most popular launching points is in Chokoloskee, just south of Naples. Here, you are at the doorstep of the remarkable 10,000 Islands, a must-see destination for any paddler whether you choose to fish or not. Dart in and out of any number of the 10,000 islands that act as a barrier between the ocean and the Florida shore. With proper preparation, it is possible to camp overnight at some of the islands. Throughout the summer months, though, it’s not recommended due to the high “misery factor” from all the bugs and the humidity. 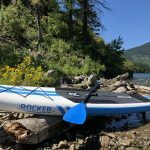 But this article from Florida Rambler offers great tips for a nice exploratory day paddle to one of the easier to reach islands of the group. Many of the islands are set up with primitive restroom facilities, boardwalks, and small picnic areas to make exploring the islands a little more enjoyable. Experience wild, untouched Florida at its finest and land a big one while you’re at it in the marvelous Florida Everglades! Paddle and Sightsee Florida’s Historic Cities! Let’s face it, Florida traffic can be a nightmare sometimes. In fact, I-4 in Orlando was recently named the nation’s most dangerous highway. So why not skip the highway in favor of the waterway for a sightseeing tour of Florida’s most historic cities? Nearly all of Florida’s cities that have access to water offer some sort of SUP tour where you can explore various parts of the city or outlying regions. It’s a win-win-win situation where you get a scenic and historic perspective of the area while also getting some exercise (and a tan!) while doing it. 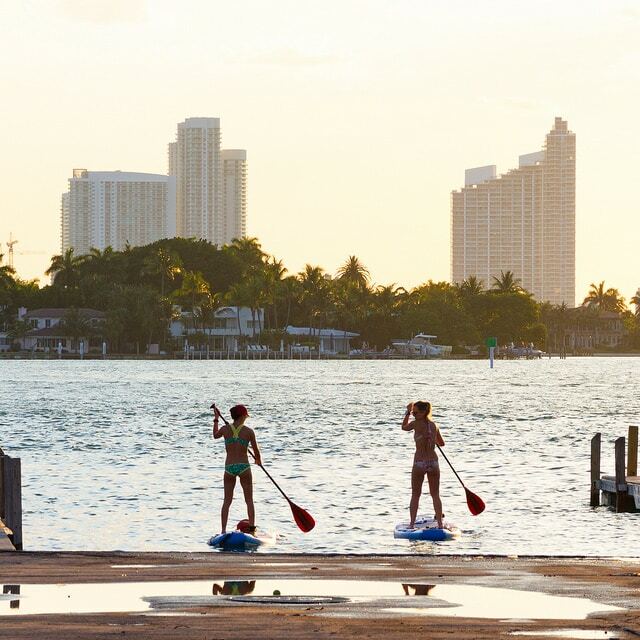 Take a Neon Tour with Miami Beach Paddleboard. Set off at sunset on paddle boards equipped with LED lights and enjoy Miami’s skyline as the sun sets. There you have it! Enough paddling and adventure activities to keep you coming back to Florida for years to come. Make sure to tell us about your favorite paddle spots or other Florida adventures you like to go on in the comments below. I plan on trying to do as many of these as I can. Thanks, Ben! Glad you liked it! Wow, such a nice place to visit.I was randomly searching for interesting places in and the pictures just amazed me.I am planning to visit the place with my family this winter. 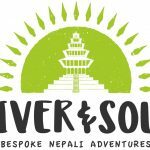 The place is too good to miss for any nature lover who loves to go for an adventure. Definitely worth a visit! Thanks for stopping by!